YOUR SEARCH IS OVER!! You don’t want to miss this WONDERFULLY UPDATED home located in the desirable community of COUNTRYPARK in Clearwater!! The elegant 4 bedroom 3 bath 3 car garage CUSTOM built home features more that 3100+ heated square feet and is located on a LARGE CORNER lot with almost 1/3rd acre lot!! Walking past the tropical landscaping will lead you to the beautiful ETCHED FRENCH DOORS. 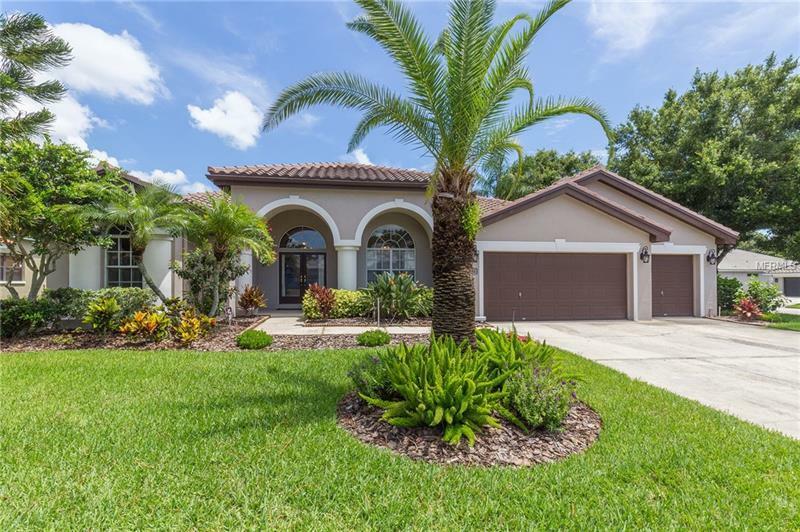 Upon entering you will notice the vaulted ceilings arched doorways crown molding travertine floors in the foyer and wood floors in the formal dining and living room. The CUSTOM KITCHEN has staggered cabinets with lots of storage cabinet height breakfast bar gorgeous granite undermount sink built-in desk built-in microwave and oven drop-in stove and staggered travertine flooring and opens to the huge FAMILY ROOM w/wood burning fireplace!! The OVERSIZED MASTER SUITE has a huge walk-in closet and you going to FALL IN LOVE with the COMPLETELY REMODELED BATHROOM!! The 2 large guest bedrooms share another remodeled bathroom!! This home also includes a private in-law or teen suite. In-law suite features: living & dining room kitchen large bedroom w/walk in closet bathroom w/washer & dryer connections. In law suite has it's own a/c & water heater. This 800 sf area could also be used as an entertainment center as well. GUEST BATHS HAVE GRANITE!! Home has lush landscaping is fenced & has a huge screened lanai extends length of back of home w/6 person spa. THE TILED ROOF WAS JUST REPLACED IN 2015!! Countrypark – an incredibly convenient location with excellent A+ elementary school easy commutes and WALKING DISTANCE to multiple parks and new dog park and Lake Chautauqua Park shopping schools and loads of restaurants and HOA dues are only $125. This tastefully remodeled home and amazing location is the perfect combination- do not miss it.